Fletcher's video has me sitting here speechless. I'm rejoicing with you in his accomplishments. But I'm also so very deeply touched by the bond the two of you have. Sometimes love is just so sweet and so pure that it overwhelms. That is how I felt as I watched the two of you together. Beautiful! God bless you both. bring some boxes up to the picu and you're bound to sell some more! I want to pinch his cheeks off :) lovingly of course. 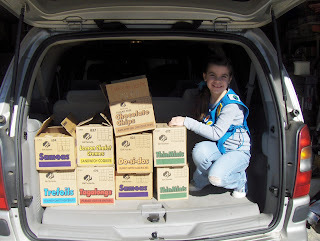 great job on cookie sales! !